Watching a dog stressing about Fireworks and loud noises is stressful for the owner as well, as it seems that no matter what you do the dog is just not coping - the dog picks up on your stress and the whole situation is exacerbated. The trouble with this behaviour is that it does not just go away by itself - the dog needs help, and the longer you leave the condition, the worse it will become. 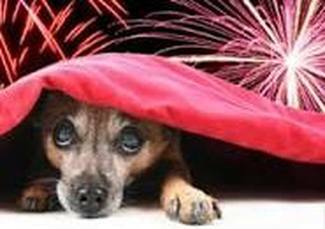 Something to bear in mind is that some people think that their dogs are fine with fireworks as the behaviour is that the dog will jump up as if trying to catch the fireworks, perhaps spin around, bark and be very excited. This dog is NOT coping – it has gone into F = Fooling Around mode which is one of the behaviours dogs may exhibit if they are not coping with a situation. Our Firework and Noise Spray really does take the edge off for dogs and an additional bonus is that you are supplied with behaviour modifications to help to reduce your dogs fear even further. For Fireworks as you know what date the festivities will take place so start to use the spray about 3 days before the event, twice a day. Spray again before nightfall and use during the evening as necessary.